As a reader who regularly follows the blog knows, in my latest piece I introduced some new concepts about the theory of niches and, in particular, I focused on showing how communities finally won a productive and inspirative role into the new cooperative product cycle that is gradually establishing. Several factors, primarily costs reduction and infrastructure development as well as the birth of extremely powerful communications and collaboration tools, created many new opportunities for unconventional community involvement moments. Communities are now able to expand their presence well beyond the consumption stage – and the historic consumer role – now ranging from design – as the case for open source software, or even of Local Motors Rally Fighter that is “Designed by the Forge community” – to production – as in the case, for example, of OpenWear the “collaborative clothing platform”. Although there are clearly different maturity levels, depending on which industry we analyse (effectively there’s a not negligible difference between automotive and software), the P2P paradigm is emerging in almost every case. The following figure attempts to put the different product phases on the same page – though things are not always so linear – and put them in relation with the main actors involved (users, communities and companies) and the roles they play according to consolidated product cycle models, already adopted in different contexts. This portrait helps seeing new unexplored production paths as well as it helps understanding the differences and similarities between different sectors (CLICK TO ENLARGE). Beyond the successes already existing in several fields, we can be reasonably confident that the p2p, collaborative model is expected to grow more, essentially according to two fundamental aspects. First, as previously described and quite clear from a figure that I will borrow from my latest post, mass production tends, by definition, to standardize the products and, therefore, to make them less fit to the needs of the individual. This incontrovertible axiom, will always leave room for an alternative production, more able to respond to one’s special needs, as long as this proves economically sustainable. With this background, a producer who deliberately decides to give up on this new model would certainly be disadvantaged, in the long term, and fated to a weakening market interest. Rather than asking if a producer, be it an individual, a cooperative, a company or a similar entity, should or should not adopt – or at least understand – these models and exploit these opportunities, we must ask ourselves what roles, choices and paradigms should it embrace and how it should begin to rethink itself and its products lines. Who does not follow this cooperation path will face leaner and more cooperative, competitors, able to thrive in this new situation, exploiting their Co-operation Advantage to gain market share and customer mindshare. In fact, the costs to access production are reducing and it is easy for those who adopt collaborative mechanisms to quickly generate significant value thanks to community engagement. They fast become threats to established players: we could mention a lot of examples, just think what he Airbnb did with hospitality, or what Tripadvisor is representing to Lonely Planet. The goal then is to understand how to prosper in a market that is increasingly linked with civil society: made up of users connected to each other that sometimes require an active role in the production itself. They claim an own production capacity, they create additional value on the base of the products that the manufacturer provides. With this background in mind, I had some fruitful and inspiring conversations with the folks at OpenPicus – thanks guys – and I tried to focus my attention on how the manufacturer’s side could eventually find a way to cooperate successfully with the peers system that make up its community and ecosystem. A special case – but general enough to be an interesting context in which to apply the analysis – is that of players producing intermediate goods, then used by users (both in a B2C and B2B way) to add value in terms of creating complex products or services of any kind. Take, for example, those who produce software, hardware – such as computers, electronics, tools and machines for printing, for music production or design, etc. …. – or even more complex tools as education, support services such as logistics or, with some respects, information. For these players the imperative must be to become the facilitator the community needs to better produce and exchange value: the value created by adopting, transforming and composing the original products in widely varying contexts. The objective of the manufacturer, for example a company, is to leverage community’s guidance while designing strategy, products line up, roadmaps and, eventually, to behave as much as possible in line with community’s expectations and needs. The act of facilitating additional value creation and exchange – within an ecosystem of different actors – could effectively represents an Opt-In advantage for those who decides to adopt the products end enter the ecosystem. Around its products, the producer should consolidate an economy – as well as a system of values – using the best tools around to speed up the interactions between the different components of the ecosystem. The ecosystem could be made of individual users, early adopters, prosumers or companies with which to build cooperation or coopetition: the exchange must be wholly simple, transparent and immediate. In this sense, some examples of ecosystems that can easily explain the idea could be: wordpress templates and plugins, arduino shields (somehow), or the very famous Mobile Apps ecosystems (being iPhone, Android or others). Supporting the creation and development of an ecosystem, goes through several steps but it all starts with creating – preferably in a cooperative way, in co-design – a lineup of products and services that makes additional products and value-added services creation, as rapid and easy as possible. By reducing the TTM the opportunities to create new value on top of the product line in question becomes instantly more attractive. To name a few product characteristics, let’s focus, for example, to homebrew and prosumer electronics components (that’s why I’m thanking the Openpicus guys). This kind of products must be highly modular, they must provide strong support for standards and existing certifications (if any, mainly FCC and CE certifications in this case): by doing this, the producer will ensure that those who use these products can easily combine them among themselves and with others, and easily marketize their complex products and services in a safe and immediate manner. 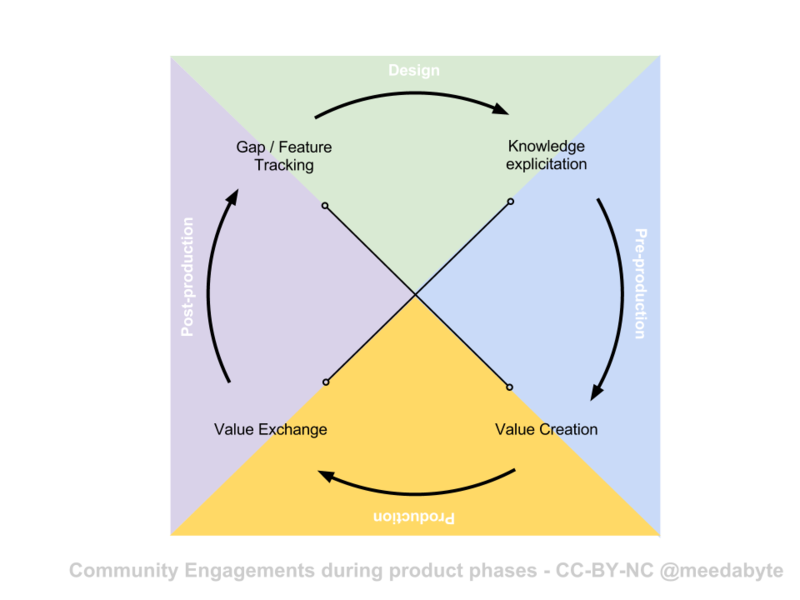 Furthermore, you – as a producer – need to create places for value exchange (like marketplaces), places of knowledge explicitation (such as wikis), places where skills about products emerge, compare, and gain visibility and recognition (like forums and communities). This contributes to generate exchange dynamics such as those which enable a rapid ecosystem growth in both quantitative and, especially, qualitative terms. From an investment dynamics point of view, similarly to what happens for traditional industrial production, the early phase requires value to be injected into the system. 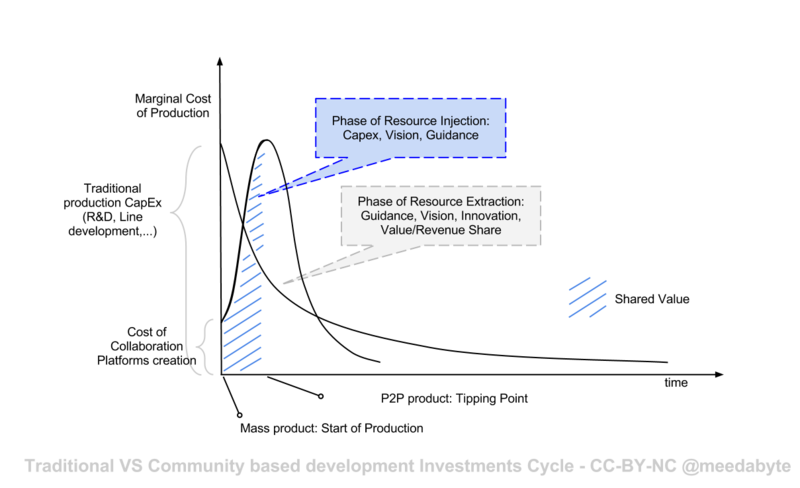 Unlike the traditional context however- where initial investments are substantial and product value decreases along with the marginal costs of production over time – in the collaborative development the initial investment is usually small and coincides with the creation of places for community engagement. This stage is then followed by a more complex one during which you continue to inject value to build a community: soon, however, the community itself begins to produce value autonomously in case you’ve succeeded to build an ecosystem. If things go well, during the following phase the manufacturer/producer does not actually inject more resources but instead, by acting as a catalyst, it can extract innovation, strategic leadership, workforce and revenues. 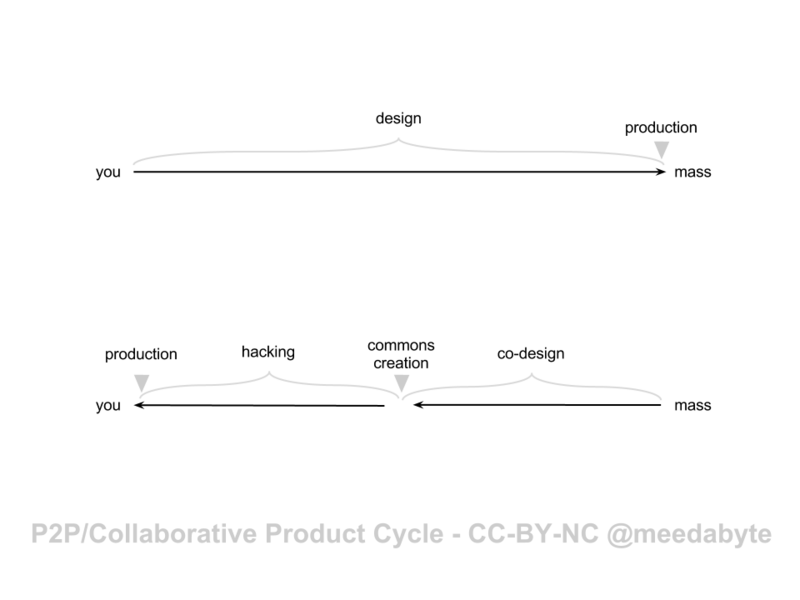 The very same cycle has a much smaller duration, allowing for faster product iterations and, ultimately, helping to innovate more radically. These are just some of the reasons that lead me to believe that the P2P production represents a true evolution of mass production. It seems to me a production process that finally learned how to tame the globalization and the global society. Follows the translation of the post in Italian. Chi tra voi segue il blog con più assiduità, sa che, nel mio ultimo pezzo, ho introdotto alcuni nuovi concetti sulla teoria delle nicchie e che, in particolare, mi sono soffermato sul dimostrare come la comunità degli utenti abbia conquistato definitivamente un ruolo produttivo e ispirativo nel nuovo ciclo di prodotto che va pian piano affermandosi. Diversi fattori, in primis l’abbassamento dei costi e lo sviluppo di infrastrutture di comunicazione e collaborazione estremamente potenti, hanno generato numerose nuove opportunità di coinvolgimento delle comunità in momenti che tradizionalmente non li vedevano protagonisti. Le comunità sono ora in grado di espandere la loro presenza ben oltre la fase del consumo – e lo storico ruolo di utente consumatore passivo – spaziando di fatto ora alla progettazione (il design) – come avviene per il software opensource o anche nel caso del Rally Fighter di Local motors “Designed by the Forge community” – ora alla produzione – come nel caso dei capi di design di OpenWear. Malgrado siano evidenti diversi livelli di maturità, in dipendenza dell’industria che si analizza (dal software all’automotive la differenza non è certo trascurabile), il paradigma p2p si sta affermando in ognuna delle fasi del product cycle. La figura che segue è un tentativo di porre le diverse fasi in relazione – malgrado le cose non siano sempre così lineari – relazionando tra di loro anche gli attori principali (l’utente, la community e le companies) e i ruoli che rivestono in accordo a modelli di ciclo di vita di prodotto già adottati in diversi contesti. Questa classificazione ci aiuta di certo a intravedere come nuove e ulteriori strade siano ancora percorribili e a capire le differenze e le affinità tra i diversi settori. Perchè il modello si afferma? Al di là del successo già dimostrato in diversi campi applicazione possiamo essere ragionevolmente convinti che il modello p2p, collaborativo, sia destinato a crescere oltre in virtù essenzialmente di due aspetti fondamentali. In prima battuta, come descritto già in precedenza e abbastanza evidente dalla figura che prendiamo in prestito dallo scorso post, la produzione massificata tende, per definizione, a massificare i prodotti e, dunque, a renderli meno aderenti ai bisogni dei singoli. Questo é un assioma incontrovertibile che lascerà sempre spazio a una produzione alternativa, più capace di rispondere ai bisogni di ognuno, qualora questa si dimostri sostenibile economicamente. In secondo luogo, la produzione industriale tradizionale manifesta un gap di efficienza e rapidità e le soluzioni collaborative si stanno dimostrando in molti campi meno costose, più capaci di innovare, più accessibili e in definitiva più efficienti come spiega questa piccola infografica che mette a confronto wikispeed, local motors e l’industria automotive tradizionale. Fatte queste premesse, un produttore che decidesse, deliberatamente, di rinunciare a questo nuovo modello sarebbe di certo svantaggiato e, nel lungo termine, destinato a perdere mercato e interesse. Piuttosto che chiedersi dunque se un produttore, sia esso un singolo, una cooperativa, una company o una entità simile, debba o meno adottare – o quantomeno comprendere – questi modelli e sfruttare queste opportunità, occorre dunque domandarsi quali ruoli, scelte e paradigmi debba esso abbracciare e in quale modo esso debba cominciare a ripensare se stesso e i suoi prodotti in questa nuova ottica. I produttori che non seguiranno questa strada di co-operazione con le community dovranno affrontare competitor più snelli e cooperativi, capaci di prosperare in questa nuova situazione, dotati di un Vantaggio di Cooperazione. 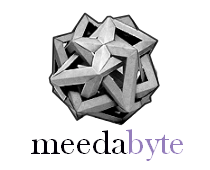 Daltronde, i costi di accesso alla produzione si riducono ed è facile, per chi adotta meccanismi collaborativi, generare rapidamente un valore significativo grazie all’engagement della community stessa diventando velocemente una minaccia per i player stabiliti sul mercato: potremmo fare molti esempi, si pensi a cosa ha fatto Airbnb con l’industria della ospitalità, o quello che sta facendo Tripadvisor a Lonely planet. L’obiettivo dunque è capire come prosperare in un mercato legato sempre più a doppio filo con la società civile, fatto di utenti connessi tra loro che si propongono e talvolta esigono un ruolo attivo nella produzione stessa avocandosi una propria capacità produttiva, creando valore aggiunto sulla base dei prodotti che il produttore gli fornisce. Con queste premesse in mente, e grazie ad alcune fruttuose chiacchierate avute coi ragazzi di OpenPicus, un produttore di hardware per il web of things, ho provato a focalizzato l’attenzione su come il business, il lato del produttore, possa trovare la via di cooperare al meglio con i peers che costituiscono la sua comunità di utenti e il suo ecosistema. Un caso particolare ma allo stesso tempo generale abbastanza da costituire un contesto interessante in cui applicare questa analisi è quello dei player – tradizionalmente aziende – che producono beni intermedi, usati poi dagli utenti (sia in modalità b2c che b2b) per generare ulteriore valore (in termini di prodotti complessi o servizi di ogni tipo). Pensiamo ad esempio a chi produce software, prodotti hardware – come i computer, l’elettronica, gli strumenti e le macchine per la stampa, per la produzione musicale o per il design, etc…. – ma anche strumenti più complessi come la formazione, servizi di supporto come la logistica o anche, per certi versi, l’informazione. Per questi player l’imperativo principale deve essere uno, trasformarsi nel facilitatore di cui la community ha bisogno per produrre e scambiare valore al meglio: quel valore creato mediante l’adozione, la trasformazione e la composizione dei prodotti di origine con altri, in contesti largamente variabili. L’obiettivo del produttore, ad esempio l’azienda, é lasciare dunque che la community contribuisca a disegnare le modalità di interazione, la lineup dei prodotti, la loro evoluzione e roadmap, il più possibile in linea con le proprie aspettative e necessità. Questo nell’ottica di favorire la costruzione di ulteriore valore e lo scambio dello stesso – la nascita di un ecosistema – tra i diversi attori di quel sistema economico, realizzando di fatto un vantaggio di base per chi decidesse di adottarne i prodotti. Intorno ai propri prodotti, occorre dunque consolidare un mercato di scambio economico e valoriale, mediante strumenti che esplicitino al meglio queste interazioni tra i diversi componenti dell’ecosistema (i singoli utenti, gli early adopters dei prodotti, i prosumer, le altre compagnie con cui realizzare partnership in co-operazione e co-opetizione) e rendano questo scambio un’operazione del tutto semplice, trasparente e immediata. In questo senso alcuni esempi che possono facilmente chiarire l’idea sono quelli dell’ecosistema dei template e dei plugin di WordPress, delle Arduino shield (almeno in parte), o quello, imperante, delle App per l’iPhone o per Android. Facilitare la nascita e lo sviluppo di un ecosistema, passa attraverso diversi step ma di sicuro tutto parte col creare – meglio se in maniera cooperativa, in codesign – una lineup di prodotti e servizi che renda la realizzazione di ulteriori prodotti e servizi a valore aggiunto, sulla base dei primi, il più immediata possibile (abbattendo il Time To Market): questo renderà appetibile l’opportunità di creare nuovo valore on top la linea di prodotti in questione. Per fare un’esempio, se parliamo di prosumer electronic e open hardware (è per questo che ringrazio i ragazzi di Openpicus con cui ho scambiato diverse opinioni nell’ultimo mese) è basilare che i prodotti siano caratterizzati da una grande modularità, che offrano un forte supporto agli standard e alle certificazioni esistenti (qualora ne esistano, in questo caso FCC e CE): questo farà si che chi utilizzerà questi prodotti potrà facilmente combinarli, tra di loro e con altri, e commercializzare i suoi prodotti o servizi complessi in maniera sicura e immediata. In secondo luogo occorre creare luoghi di scambio di valore (marketplaces), luoghi di esplicitazione della conoscenza (come i wiki), luoghi dove le competenze sui prodotti possano emergere, confrontarsi e ottenere visibilità e riconoscimento (forum e communities): questo contribuirà a generare dinamiche di scambio tali da permettere all’ecosistema una rapida crescita in termini sia quantitativi che, soprattutto, qualitativi. Da un punto di vista di dinamiche di investimento, del tutto similarmente a quanto avviene nella produzione industriale tradizionale, la fase iniziale richiede di iniettare valore nel sistema. A differenza del caso dell’industria tuttavia – dove l’investimento iniziale è sostanziale e il valore del prodotto diminuisce, coi costi marginali di produzione, nel tempo – nel caso dello sviluppo collaborativo l’investimento iniziale è di solito più ridotto e coincide con la creazione dei luoghi di engagement della comunità. A questa fase ne segue una più complessa in cui, solo all’inizio, occorre continuare a investire valore per costruire una comunità: ben presto infatti questa comincia a produrre e scambiare valore al suo interno nel caso fortunato in cui si realizza un ecosistema di successo. Se si è operato bene, in questa seconda fase il produttore può effettivamente smettere di iniettare risorse bensì, agendo come un catalizzatore, ricavarne, in termine di innovazione, guida strategica, forza lavoro e ricavi. Il ciclo di prodotto stesso ha una durata molto minore e permette nella maggior parte dei casi di iterare nuovi cicli più velocemente, in fin dei conti, innovando più radicalmente. Questi sono solo alcuni dei motivi che mi spingono a credere che la produzione P2P costituisca una vera e propria evoluzione della produzione di massa. Essa è una produzione che ha finalmente imparato a domare la società globale e la globalizzazione. la “parte del puzzle” che più mi mancava! sono abbastanza complementari tra loro! Grazie Gianmarco, Non vedo l’ora di scambiare due parole.